Michael Geary is a native of Mason City, Iowa where his professional career began in municipal bands there and in Clear Lake as well as jazz gigging with a regular trio and quintet. He became an extra percussionist with the QCSO (Tri City at the time) as a college freshman and was appointed Timpanist three years later. The same year he became Resident Percussionist with the UI Center for New Music, beginning a 14-year association with that ensemble and ultimately developing a reputation as a skilled interpreter of challenging 20th Century repertoire. He has premiered numerous solo and collaborative works often working directly with composers and performing from coast to coast and Alaska at conferences and universities. While at the UI, Geary was a member, instructor and composer for the Hawkeye Marching Band over the course of ten seasons. 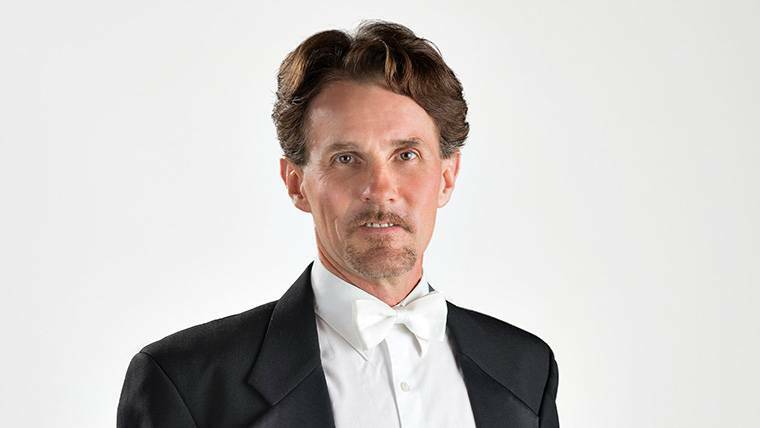 Geary is also Timpanist of the Des Moines Symphony and Percussionist with Orchestra Iowa. He has performed often in Hancher Auditorium and other area venues. He champions Australian composers, whom include Carl Vine, presenting the premiere of the orchestrated version of his Percussion Concerto in Des Moines and the North American Premiere of the Percussion Symphony with colleagues from the QCSO. In 1992 he joined the orchestra of the Spoleto Festival, performing during ten seasons in Italy and four in Charleston, South Carolina. He took part in such projects as Prokofiev’s War & Peace, Berg’s Wozzeck, Strauss’ Der Rosenkavalier and Elektra, Shostakovich’s The Nose and diverse works of festival founder Gian Carlo Menotti. He was also featured in Milhaud’s Creation du Monde, Crumb’s Madrigals and the American Premiere of Mauricio Kagel’s Oral Treason. He performed there with renowned artists, among them Luciano Pavarotti, Renee Fleming, Placido Domingo, Jean-Yves Thibaudet, Renata Scotto, Cynthia Lawrence and conductors Richard Hickox, James Conlon, Steven Mercurio, Christopher Keane, Emmanuel Villaume and Spiros Argiris. Geary’s contemporary projects include performances and recordings with David Gompper, Lewis Nielson, John D. White and Cellist Craig Hultgren (former QCSO member and a Davenport native). He is heard on numerous Spoleto Festival recordings on the Chandos label as well as CRI, Music & Arts, aca, and Innova. He is currently on the faculty of Luther College, Decorah Iowa. Performing the percussion concerto The Glory and the Grandeur by Russell Peck, with Tom Mackey and Alan Lawrence, conducted by Maestro Tiemayer, broadcast on IPTV, with my parents and many friends in the audience. Mason City, Iowa music (bands) program. Annual Band Festival Parades. Municipal Bands Jazz combos. But I am a professional musician…who could ask for anything more?